So Windows 8 Consumer Preview is out today. You probably read the Windows 8 Consumer Preview Announcement by Steven Sinofsky and then rushed off to Download it. Disclaimer: Hopefully you are a technical person or you are not afraid of totally destroying your computer with new preview software. Even better, you aren't the kind of person to rage on a stranger's blog when his totally unsupported instructions on how to install the Windows 8 Consumer Preview onto a VHD delete everything you know an love. You're on your own, friend. I don't work for the Windows team and you don't know me. Remember that as you edit your boot records and destroy your PhD thesis. To the cloud! You don't want to take any chance with dual booting or getting a slower experience inside a regular Virtual Machine. Cool. If you have Windows 7 now then you can "boot to a virtual hard disk (VHD)" and get all the loveliness of Windows 8 running on hardware without any risk to your hard drive. Don't like it? Delete the VHD and update your boot record. HUH? What does this mean? What this means is that ONLY the Hard Drive will be virtualized. Your Windows 8 system will run ON THE HARDWARE with your real video card, real CPU, real network card, etc. However, it will NOT run directly from your hard drive - it will run from a file on your hard drive. Windows 8 will live and run on its own personal "virtualized hard drive" which is the VHD. Ok, now that that disclaimer and expectation setting is done. I don't work for the Windows team, and you don't know me. I am just a guy who loves Boot to VHD. I wrote the Guide to Installing and Booting Windows 8 Developer Preview off a VHD (Virtual Hard Disk) that you may have used last year to play with the build of Windows 8 that was released at the BUILD conference. Updating from Developer Preview? Delete and start over! If you want to now try using the Windows 8 Consumer Preview and you already have a VHD setup with the Developer Preview from last year, you can simply delete the existing VHD from your hard drive, then run "msconfig.exe" as administrator and delete the existing boot entry as seen in this screenshot. Then just setup a new VHD all over again for this new Consumer Preview version of Windows 8. That's the magic of boot to VHD. You can just remove the VHD. You can even have multiple versions if you have the disk space. Just make sure your boot record is up to date. The original instructions on how to boot Windows 8 from a VHD still work and are valid for the Consumer Preview. They work on my machine. I did want to slightly update the post with additional information with the help of a number of people internally with some techniques that may make things easier for you. Thanks to Iain and friends. I boot to VHD all the time. It works great, and the idea of booting to some VHD is a supported thing to be doing on Windows 7. Boot to VHD is a great actual feature of Windows 7 and Windows 8. Why do it? Try a virtualization solution, but it might not work, I may not have the drivers I need and it won't be as shiny as running "on the metal." In fact, the Windows 8 team says this: "Our recommendation for the Consumer Preview is to run it natively on hardware if you intend to run Windows 8 on hardware when the product is final. Some of you will run virtualized environments for enterprise workloads or specialized purposes, but we strongly recommend that you experience Windows 8 on hardware, as it was designed to run for the majority of consumer experiences. " Sacrifice a machine I have lying around. I'll probably do that at some point, but I'd like to try it out on my actual hardware that I use all day long. Swap out my C: drive and use my main machine. I don't have a tool-less case, and I'm also very lazy, so, um, ya. Dual boot. Dual booting may feel ninja but it ALWAYS ends on tears. And sometimes blood. It's that last option that is the best one, in my opinion. Windows 7 included the ability to boot windows from a Virtual Hard Disk File (.vhd). You can read more about the Windows 7 VHD boot capability and recommendations from the TechNet article here. The Windows 8 developer preview was downloaded millions of times and the word on the street is that there was a huge increase in installations in virtualized environments. I think booting to VHD is way better than installing in a truly Virtual Machine because it allows Windows 8 (and you) to really access the native hardware and shine. Here's the requirements if you want to try this. Boot VHDs need to be on an internal drive. USB drives won’t work. 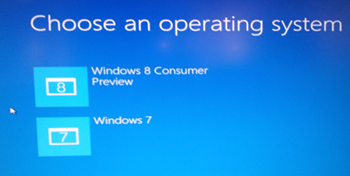 More importantly, READ THE WINDOWS 8 CONSUMER PREVIEW FAQ! If you like doing things manually, you should directly the Windows 8 Consumer Preview ISO. I'd recommend burning Windows 8 Consumer Preview to a DVD or a USB Flash drive so you can easily install it on other machines easily. You can certainly do other ISO mounting tricks with other tools if you want to, but honestly it's just cleaner and easier to go download the Windows 8 Consumer Preview ISO and do it the regular way. There's less moving parts and all that. The easiest way to convert an ISO file to a DVD in Windows 7 is to use Windows Disc Image Burner. On a PC running Windows XP or Windows Vista, a third-party program is required to convert an ISO file into installable media—and DVD burning software often includes this capability. One option is the USB/DVD download tool provided by the Microsoft Store. You can also download Windows 8 Consumer Preview Setup, which includes tools that allow you to create a DVD or USB flash drive from an ISO file (Windows Vista or Windows 7 required). Read the disclaimer at the top again. I don't know you and you're installing Beta software. . Here's the general idea in broad strokes. The tiny details we'll be following are on my Guide to Installing and Booting Windows 8 off a VHD (Virtual Hard Disk). Either burn your downloaded ISO to a DVD or make bootable USB Key manually. I detail making a USB key from an ISO in Step 1 on at my post, the Guide to Installing and Booting Windows 8 Developer Preview off a VHD (Virtual Hard Disk). 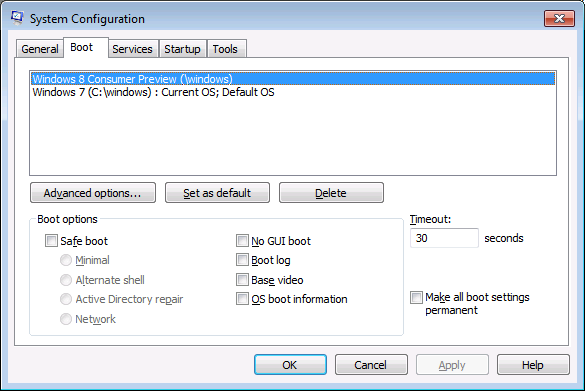 Reboot and pick your operating system with the new lovely Windows 8 boot manager. Alright. Sound good? You have some bootable media (DVD/USB) all setup with Windows 8 Consumer Preview? Now head over to my original post and start at Step 2. Fun! Then delete the VHD and and reboot your system. If any of this is scary or you don't know what you're doing, then just stop and go here now. By running the BCDBOOT command, you’ll set the Windows Boot Manager writes the entry to the Master Boot Record (MBR) of system as the default. A system can only have one Boot manager at a time. If you want to revert to your previous boot loader, just follow that software’s normal installation instructions. I've heard some reports of GRUB supporting .VHD boot, but we have not tested it. You're on your own. Can I do this on a Mac? No. Apple MacOS uses Unified Extensible Firmware Interface (UEFI) which locks the Guid Partition Table (GPT). The GPT holds a similar position in the UEFI systems as MBR for the BIOS systems. Why does the VHD need so much space? VHDs are created as dynamically expanding by default, up to 40gb which get expanded to their full size when used as a boot disk. Some people like them to be even bigger. Note: The reason why the boot VHD gets expanded to its maximum size run running is to avoid the case where the hosting volume runs out of space when it is being actively being used as a system disk. If the hosting volume does run out a space, it would result in an unexpected system reboot. The user would need to boot into an alternate OS or recovery partition to free up space on the hosting volume before he can boot into the VHD again. Can I use some other tools to do this? There are a number of tools that do things like bcdedit in a graphical environment. I like Bellavista which I have used on Windows 7. However, do note that I did not test or run the steps above using anything but the tools in Windows. Hope this helps you have fun testing Windows 8 Consumer Preview in a safe way. Now I want to understand, when you say "Boot from VHD" do you say that my HOST computer will be booting? Or its a virtual machine which will boot this vhd just like any typical VM works? Asif - What this means is that ONLY the Hard Drive will be virtual. Your Windows 8 system will run ON THE HARDWARE with your real video card, CPU, etc. However, it will NOT talk directly to your hard drive. It will have it's own "virtualzed hard drive" which is the VHD. Can't we really boot this from an external usb drive? It would be more practical. Instead of creating a new VHD, I just attached my existing developer preview VHD and then reformatted it during the install process. Thanks, Scott! I successfully created the bootable vhd last night from your previous guide, and there was one step missing that I don't see mentioned in this update either. Be sure to write down the product key (available on the download page) for use during the install process. Also, I had the problem where the drive letter for my partition was incorrect, so it took some finagling to find the correct drive letter. On my system, its designated as the W: drive, but during the install, I had to point to F: drive. I simply ran the "select vdisk file=W:\VMs\Win8.vhd" command for each drive letter until I found the correct one. Sinofsky mentioned in his post that you can do an in place upgrade from the dev preview to the consumer preview. Is there any reason why this would not work for a dev preview that was installed under Scott's previous VHD approach? Seems like the upgrade process shouldn't care. That was the path I was going to take since this all is temporary anyway. VHD is awesome; I had issues where I couldn't get VHDs created on my machine so I sprang for Portlock Leapfrog (I think it's $30) and that worked great. I am actually running my main PC off a VHD because my older OS drive was having issues and I wanted an easy way to upgrade to an SSD later. I like the link to Disney at the end and the contextual Disney banner ad too. Ha! Nice touch! I haven't tested on a Mac, but I successfully installed Windows 8 to a VHD on a P8P67 PRO booting through UEFI (what was an existing Windows 7 UEFI installation). Carlos - As I understand it because USB drivers are loaded very late in the boot process it's not possible to boot to VHD off a USB drive. Mark - yes, I thought about that but decided (on my own) to not recommend it. When doing Beta work it's almost always just better to start from scratch. Martin - Good point. You can also (and probably should) use [Locate]\mywin.vhd and let windows find the drive letter. I still prefer EasyBCD for messing with the MBR. Really want to try this, but got burned on the Developer Preview wasting hours and not being able to get it working (likewise other people I know). If Microsoft want to sell me more things then they have to make it easier for me to see them! Boot to VHD is so cool, I wish there were an advanced windows installer that let you just do it completely setup free though. Just boot direct from the Windows 7 disk where it puts a minimal version of windows allowing you tovjust attach, delete and clone VHD's and it configures the boot loader for you. Basically Hyper-V server for the home, I guess it would only appeal to dev's though. How about an article on Visual Studio 11 Beta's new UI? I really didn't like it when I first saw it but after using it I must say it has grown on me in some ways. I still don't like the CAPS LOCK WINDOW NAMES and :::::::: in the titles though. We can read lowercase much easier and faster because of the shape of the word. I think a little colour could benefit the important toolbar icons too. "We couldn't create a new partition or locate an existing one. For more information, see the setup log files"
Does any one have an idea what's wrong? ps: Core i7, Gigabyte UD7 motherboard, trying to boot off a USB flash drive. Nice, I wasn't aware of msconfig before. Thanks, Scott! I have 2 HDDs, 1 Flash drive (for ReadyBoost). So I changed the sequence of these drives in the BIOS and the installer works now. Too bad I realized this *after* formatting one of the partitions on my main drive. No data loss though. This partition just holds game installations. Also, why is it that when you select Windows 7 on the boot screen the computer resets and boots into Win7? Anyway, thanks for the help Scott. Nope, didn't work for me. My VHD is on my F: drive in Win7, but the drive letter I had to use for the diskpart step was H: - I don't know if this screws things up. Anyway at the first reboot after install, I went right back into Win7. When I added a new boot entry using BCDEDIT (to vhd=[F:]\... , because vhd=[H:]\... gave an error), booting to that gives "boot selection failed because a required device is inaccessible". Well gave it a few tries, couldn't get it to install via a dvd to the vhd, kept dieing during the file expansion process. Argh! My bad - needed to enable VTX in the BIOS to get it to work. Worked for me, and was actually slightly easier than described. I didn't start with the ISO, I started with the download installer. If you run that straight from Windows 7 it'll do a report on things that won't work, but then when you start install, and say you want to do a custom install (not in place) it will actually create a bootable USB drive for you if that is the option you choose, right from the installer. After that, your instructions worked fine, and I installed successfully on two machines. Very nice. Mark, the installer doesn't allow you to upgrade a VHD-based Win 8 Dev Preview. Don't know why, but it checks early in the setup process. I mounted my VHD in Win 7, pulled off the files I needed and deleted it. All goes well until the installation tries to modify my boot configuration. Then there is an error message saying that it cannot modify it and the installation is cancelled. I'm running Win7 (64 Bit) and trying to install the 64 Bit Version of Win8 now. Any idea what could be the reason for this? I created a short installation guide and screencast for installing the Windows 8 Consumer Preview in a boot to VHD environment using Native Boot at http://ericdboyd.com/2012/03/02/how-to-install-windows-8-with-native-boot-to-vhd/. I'm running into the same issue as kaiz.net... what could cause the issue? Wayne, try try [locate]\yourvhd.... the [locate] will scan for the VHD. Don't add a colon. Just tried again with the VHD on C:. Now the installation completes and the boot configuration is modified, but when it starts I get an error screen (the Windows 8 BSOD) that says "VHD BOOT INITIALIZATION FAILED". Any idea? that was a great tip, thanks! I moved the VHD to c: and it works now. No BSOD for me. The previously used disk is on a dynamic volume (mirror managed by Windows) and that might have been the problem. Anything special about your c: or your BIOS? If any of this is scary or you don't know what you're doing, then just stop and go here now. 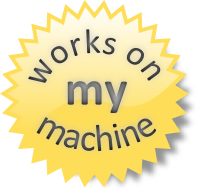 That "works on my machine" graphic made coffee come out of my nose. Damn, that's funny. Any pointers? Also, you mention locate - where would this be used and how? Why do you think so? Mac has BootCamp and Mac UEFI can chain the Windows bootloader. The only hard part would be updating the bootloader from Windows 7 to Windows 8 without actually installing Windows 8. Any ideas here? Then I'd just create Windows 8 VHD on my PC, copy it to Mac and "attach" to the BCD. This is a great idea. Since I have an SSD I feel that this could be hard on the drive. How bad would it be to run Visual Studio 2010 and 2008 on this Windows 8 Consumer Preview in theory? As a main dev machine. I just finished a blog post on installing Windows 8 on an existing VHD, I hope it's helpful! Finished installation on Mac (had to install to VHD since bootcamp doesn't support two Windows installations). Aside from a problem with bootcamp setup not wanting to start everything went fine. Running bcdboot.exe W:\Windows under Windows 7 32bit somehow successfully managed to update the main bootloader from the VHD Windows 8 64bit install. Cool. I thought it would only add 8 to the 7's OS list. Just learned now (by reading the comments) that you can do this [Locate]\win8.vhd Anyway, I found the correct partition through the LIST command inside diskpart. This is fun! I just need to run VS2010 for work (together with say 10-20 other smaller tools and one big framework) - so I'm not building entertaining-home-centre-machine with not-compatibile stuff appz - just MS tools on great Intel rig. - only the system is on VHD (max 40GB), but I can access all my other partitions (I have 1GB in notebook) with projects/resources formatted by robust Win7SP1 without any danger, reading and even writing on them. Then it would make sense for me to do a VHD option, as just the 40GB file on one of my partition would be dedicated, all the rest of the HDD would be 'untouched'. Re-partitioned/formatted by Win7 OS which I used safely for 2 years, with ability to recover/chkdsk them from win7 if win8 would screw something up. I meant that *IF* I can access (even write to) all the other partition (win7sp1 formatted) from within Win8 installation runing in VHD . Otherwise I can't consider VHD as an main OS option. Ugh, this method requires the Ultimate edition of Windows 7. Right...turns out the issue isn't with VHD but rather with dynamic disk type. My laptop has a striped array of SSDs and the disk type is dynamic. It had some partitions. I set aside a partition, formatted it and tried to install the consumer preview on the real partition (not a vhd). This installed but could not boot at all. Next, I just upgraded my laptop's Win7 to Win8 consumer preview (on the C drive) and it's been working perfectly till now. It kept all my old windows files in a folder called Windows.old which I took ownership of and deleted (freed up 20Gig and I've got backups on an external disk). Would the RTM version support installing to a partition on a dynamic disk? While I'm happy to use the consumer preview as my main machine, I can think of many scenarios where I would want to install to a separate partition or vhd. Wonderer just reading here that Windows 8 consumer preview runs IIS8. This would be very risky develping against IIS8 then deploying to IIS7. Does this still update the Bootloader to the spiffy Win8 version or can we use it with the Win7 bootloader? When trying to 'select vdisk' my drive letters were also renumbered so I got "the system cannot find the path specified", but I just exited DISKPART, and went through each drive letter running 'DIR' until I found the right one. I didn't know about [locate] but will keep that in mind for the future. 1. Whats the easiest/best way to remove Windows 8 after I'm finished playing with it? If I delete the VHD, will this screw up my boot menu? 2. Has anyone used this method to install Win8 on a Mac? I am trying to triple boot but I am unable to since the MBR is limited to 4 primary partitions. My partitions are 1)EFI 2) Lion 3) Lion Recovery 4) Win7. When I try to install Win8 to my 5th partition, Windows install says I cannot install that that partition due the the MBR limit. Will using a VHD get around this and solve my issue? 3. What kind of performance difference can I expect from using a VHD versus a "real" partition or HD? Works like a charm Scott, thanks for sharing. Anybody running this as a main OS yet? Hi Scott, I believe that (based on my experience, and a couple of comments above) that the VHD (whether or not the VHD itself is dynamic) CANNOT be hosted on a Dynamic Volume. I got the dreaded VHD_BOOT_INITIALIZATION_FAILED BSOD after the install. Seeing a couple of comments suggesting this might be a problem, I moved the VHD to a basic volume, edited the boot settings (BCDEDIT /set device and osdevice to the new location) and rebooted. Magic, the install completed. Scott, thanks for this. Really like learning about backing up the Boot Manager Database. @Zubair Ahmed - I've been digging PowerShell recently and the link you provided really helped me out. I've had the hardest time getting my EVGA motherboard to boot from USB, but using PowerShell to install Windows 8 to the VHD was awesome. Scott, I like this post and used it for Win 8 CP. Thanks so much. Is there any reason I cannot use this same method to run a 2nd version of Win 7. My primary machine would be for day to day work, and the 2nd Win 7 would be for testing software and things I don't want on my work machine. Right now I use Virtualbox for this, but it seems to me this new method would work better than a VM would. Sorry for opening an old thread. I could not boot to Windows 8, and it messed to boot records, so I had to repair it to be able to boot back to Windows 7. I love VHD boot and have used it many, many times without issue and would consider myself well beyond novice level (I do it with my eyes closed). However, I seem to be having an issue with the Release Preview of Window 8. I have gotten as far as attaching my VHD, (on certain attempts I also use DISKPART to create and format the volume and assign a drive letter), selecting the attached drive to install Windows into, and starting the install. Every attempt ends with the same result. The 'Copying Windows files' step executes in roughly 5 seconds, but the 2nd step (I believe it's "Installing files") gets to 3% before the install crashes, saying that not all of the needed files are available on the installation media and that I should check the install media and try again. 1. I installed both the Developer Preview and Consumer Preview to VHD using the same process and had no issues. 2. When using the same install media on the same box I have no issues installing direct to the hard-drive, i.e. not a VHD. 3. I set my VHD to type=expandable and maximum=92160 (expanding VHD to 90GB for those not used to DISKPART). I notice however that after the Windows 8 install crashes, my VHD has been expanded to something like 230ish GB, which is around 99% of my SSD in my machine (modded ASUS EP121 tablet PC). I then have to delete the VHD to reclaim my disk space. This happens even if I make sure the disk is already fully expanded before selecting it as the disk to install to, and it only happens after the installation starts writing files. Has anyone else had a problem like this? Have you tried to install the Release Preview to a VHD? And why on earth would my VHD be expanded to well beyond the maximum size specified when it was created? For now I have installed direct to disk, and will attempt to migrate the disk to a VHD, but any info or advise you could furnish would be well received. any help for users with windows xp/vista running ms virtualPC? Is there any way to install Visual Studio 11 Web Express on Windows 8 Consumer Preview? I searched a lot and apparently I have to install Windows 8 Release preview instead of Consumer preview, I don't understand what's difference? I just installed Windows 8 Pro (first 32-bit as an upgrade from XP, then 64-bit in VirtualBox, then 64-bit as a VHD, then finally 64-bit "bare metal" upgrade from Win7). When I booted off the VHD and ran VS2012 + the Windows Phone 8 emulator, the emulator startup time was in the range of minutes (versus seconds running bare metal). After startup, however, the emulator performed pretty well. After moving away from VHD to bare metal, VS2012 and especially the WP8 emulator are much faster (much more than 3-5%...) Is the WP8 emulator just incredibly HD I/O intensive, or is it possible the performance hit from booting/running from a VHD is actually far greater than you'd originally estimated. jp-cwe - As I understand it, the WP8 emulator is itself using Hyper-V virtualization so I suspect there is some kind of virtual hard drive inside a virtual hard drive issue going on there. Thanks, we will try it right now. I've read half a dozen of these guides, and I'd love to try out Win 8 on a VHD, but no one tells me if I can "finalize" the VHD into a real partition once I've decided I want to stick with Win 8. Is this possible? Can I easily convert the VHD into a real partition and get rid of the Win 7 install? Or would I have to reinstall Win 8 again anyway? moeburn - You'll have to install it on a proper partition. There's ways you could *theoretically* move it but it'd be super dangerous and not worth the effort. Already have Windows 8 running on vhd drive. Now that Windows 8.1 has been (preview) released, I wish to upgrade BUT the setup will not allow. Do you know if I can upgrade the vhd by booting from the .iso and pointing the installation to the existing vhd drive?